Home Blogs Team Wiggins Pro Dan Patten's Blog Up and Running, First Win in Ghoy, Belgium! Well It’s been on the cards all season and last weekend in the town of Ghoy I took my first win in Belgium. Like always the attacks came from km 1 and I managed to get away midway through the first lap – and this was to be the move that stuck. Crossing the line in first place – a great feeling. At first we were four, then three, and then six, but knowing we were being chased down I tested the water by attacking coming out of one of the corners onto a drag with 30km to go. This was still a long way from the finish but I felt it was the right time to go, and so it proved. I quickly established a good gap with the car being pulled up behind me and I knew this was as good a chance as ever to get my first win over here. And so I did, all the way to the finish, soloing my way to the line. On the final lap I began to notice two riders chasing me… two riders that weren’t in the original move. This obviously made me a bit more cautious and so I stepped on it even more. Into the last km I knew it would be mine… the acknowledgement from the marshals, supporters on the side of the road, etc, was reinforcement, but I still didn’t want to take any chances by backing off. 200m to go and the start of the finish straight and applause was my cue to relax a bit more. I had done it! My maiden win in Belgium! You could say the hard way, but done in style, and a way that I think has earned me some respect. The gap to the two riders was around 20 seconds by the line, a comfortable winning margin but enough to keep me on my toes to the end. Riding out and back to/from the race gave me a nice 170km in the sun. Obviously this meant I wouldnt be able to make it back with flowers and trophy. Solution… trophy in my bag and flowers given back to Miss Lessines 2010… a gesture she appreciated I think! Now I’m off the mark and not chasing the first win, I know there will be many more to come. The hard work and perseverance is starting to pay off. Winner’s flowers, trophy – and better bookies odds now too. I raced again a couple of days ago in a kermesse in Schellebelle. Again made the break, taking 4 primies and came close to making it back to back wins, but not quite. Everyone took a chance or two to get away in the final 10km or so but was to end up 7th. But along with 4 primies not a bad days work. And at 4-1 on the betting board, it seems I’m really starting to establish myself in Belgium too. Me? 4-1? They must be mad. Last week actually started with the experience of being worked over by the West Vlaanderen ‘Mafia’. Being warned that it would be a race that would be heavily controlled by the locals, I realised what I was in for once I got in the break away group. In brief what should have been a clear race winning break turned out not to be and much money was exchanged to get the result that was wanted! It can be another feature of the racing in Belgium but I had not seen it as bad as this before, and a local Belgian rider who I know said likewise. At least I did still finish in the prize money but this was the only consolation… prize money collected and back to Oudenaarde I went. 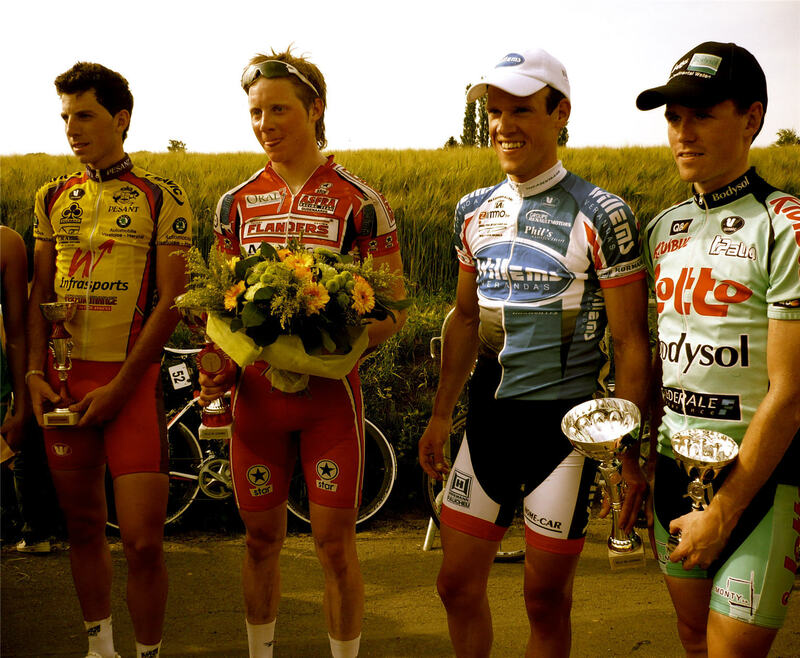 An English rider on an East Vlaanderen team – think I was always going to be up against it that day! Should be an interesting few weeks ahead with more kermesses, a couple of Interclub races, plus a pro kermesse – all this before heading to the National Championships at the end of the month. Previous articleDan Patten takes his first win in the Heartland! "I knew that if I was second or third round the last corner then nobody would beat me." And so it proved, as James McCallum added British Criterium Championship gold to Commonwealth Games points bronze, last night in Otley. VeloVeritas spoke to James just hours after his win.